A funny thing happened on the way to The Primitive Screwheads show Sunday night. 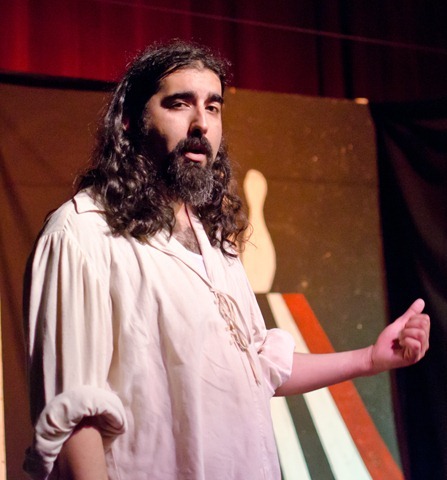 The Dudely Lama was originally booked to come up to the Bay Area to bless a production of "Much Ado About Lebowski", a theatrical mashup of Shakespeare and the Coen Brothers, by leading a recitation of The Dude’s Prayer. At the last minute His Lamaness had to cancel the trip, so he asked me to stand in for him. Being of the non-dairy persuasion, I dropped by the local Whole Foods on the way to pick up some soy milk as a contribution to the bar so that I could properly lead the ritual with a White Russian. And then the universe seemed to click into place. Here I was, beginning the evening by shuffling into a grocery store wearing flip-flips and a robe, seeking out the freshest possible container of creamer. As I selected a box of soymilk, Creedence started playing over the PA system. I finally burst out laughing when I went to pay for it and was greeted by the smiling face of Julianne Moore beaming at me from the cover of Health magazine at the checkstand. I won’t call it fate or what-have-you, but it was a time and a place, and I was in it. This was my first time leading anybody as a dubious spiritual authority. I was nervous as hell but at least I didn’t flub any of the words and I even got a few laughs during the recitation. After properly blessing the venue, we all poured in, White Russians in hand. I wasn’t sure what to expect. The program promised bowling balls and rug peeing. San Francisco theater can be, in the parlance of our times, avant-garde. Luckily for the audience, the rug peeing consisted of a rubber tube being yanked from a pseudo-Chinaman’s trousers and shooting water over the first few rows. The Primitive Screwheads’ style is definitely for grownups, but their performance style strikes the right balance between edgy and goofy. The fourth wall doesn’t exist for this troupe, giving viewer the chance to be fully immersed in inflatable beach ball "bowling" and face-to-face with the action. 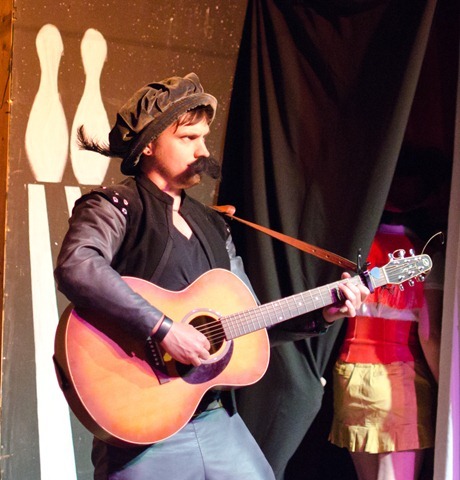 The Primitive Screwheads’ production predates the recently published script for Two Gentlemen of Lebowski, a similar but not identical mashup of The Bard and The Dude. But what both of them reveal is that, when the distraction and delight of so much profanity is stripped away, the Coen Brothers’ dialogue is downright poetical. The comedy of errors that makes up the plot of The Big Lebowski — mistaken identity, bawdy humor, star-crossed lovers and a silver lining to death — is positively Shakespearean. The Dude’s tale flows as smoothly with iambic pentameter as the sunglasses do with poet’s shirts and doublets. The play was entertaining, but it was the minstrels who stole the show. Faithfully performing live renditions of T Bone Burnett’s carefully curated soundtrack, The Primitive Screwheads’ musical trio sported ridiculously fake mustaches and hammered out hilarious versions of "The Man in Me" and even "I Am a Man of Constant Sorrow" as made famous by The Soggy Bottom Boys in O Brother, Where Art Thou?. 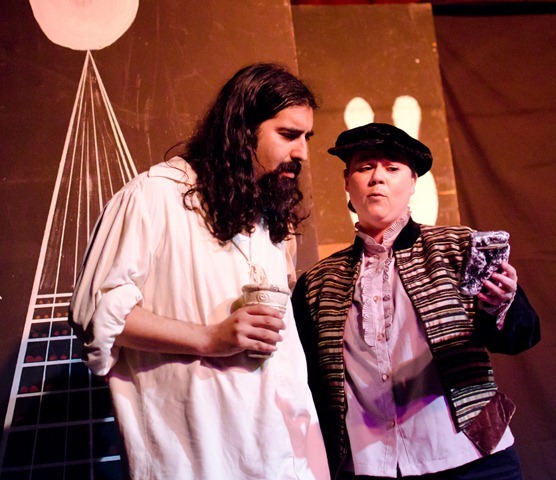 The only aspect of the play which did not work was the intrusion of characters from Raising Arizona into the mix, taking over the plot function of the LAPD in The Big Lebowski. Dogberry and Verges from Much Ado About Nothing would likely have worked better, although leaving the plot entirely based on Lebowski would have been better. 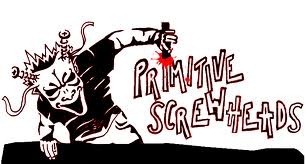 Every show at this summer’s repeat performance of Much Ado About Lebowski sold out, and with any luck The Primitive Screwheads will be back next summer for another run. In the meantime, you can catch them in San Francisco "bringing back the blood" with upcoming performances that return to their B horror roots. Good article dude! It made me smile…and in English too! Thankee! “Predates”? Because Two Gentlemen was making Internet headlines AND it was performed in New York way before this other thing. No, it does not predate Two Gentlemen. It is also not the same play though. Alright yes this is me banging on about the same old stuff, but I do object to the way “The Dudes prayer” is presented as though it is essential to the proceedings. We are not christians (though some of us are) and we don’t “have” to pray, and we don’t worship the Dude. Apart from that nice article. From the campaign for stopping people turning Dudeism into another flavour of christianity campaign. Damn, I kinda forgot we had a prayer, and on a week day no less. I swear, I think Dudely was drunk when he thought it up, lol. Sounds like a fun time, cool stuff Dude. Get em to tour on the East coast. Dudesm isn’t Caliocentrintic, we have Dudes everywhere in need of wholesome entertainment. I will say nothing about The Dudes Prayer. i guess we need to come up with dude versions of other famous religious prayers to balance it out – not make it seem so christian-derived. maybe the “have i not drunk soma” prayer from the upanishads would be good. we could change it to “have i not drunk white russians”? Most people wouldn’t know it though. Are there any non-christian prayers anyone can suggest that are famous enough to parody? of course, we could also just make up our own. I think you may be missing my point. Pray if you feel, or want, to pray, this I have no problem with. But the Lady says “which is a critically important thing to bless this sacred event”. It is this representation I object to. the prayer is not critical to Dudeism. This representation completely misses the point of the prayer. It is an absurdist abstraction. That is the point I’m making, don’t give us more prayers, don’t give us any prayers, because people get confused. The prayer is presented as if it’s important in itself, the important thing is the humour not the words. P.S. why does my comment on the facebook article on the same subject keep disappearing? Facebook reveals itself as a true Fascist state through it’s censorship. How much else is being removed without anyone speaking out. Can we not just bless this event by our presence. Like the pledge of allegiance, feel free to skip parts you don’t agree with. Just being there shows your support. @Doctor Joe – bless anything you want, any way you want, I’m just against the implication that the particular prayer is “Essential”, or an “Essential Part” of Dudeism. I regularly bless things, I even sometimes do it sober. This is the misrepresentation I object to. go ahead bless what you want where you want when you want, how you want, just don’t be telling me (or anyone else for that matter) that it is a critically important aspect of Dudeism. As I’ve said before, I am a Dudeist from the Taoist root, I am also a Pagan, i am very much against the declaration of set “prayers”, set texts. I am a Dudeist because I came to this point through an extensive study of religion, and philosophy, and that is the easiest fit to my present point of view. P.S. Please stop trying to make Dudeism another branch of christianity, it is not. Fine if you are a Dudeist Christian, or if you want to find parallels with christ and The Dude. Off you go. But stop trying to impose your overtly christian practices on my religion (yes its mine now, all mine.)! @Meekon – I think when Rev Stella says that it’s “critically important to bless this event” she is clearly being facetious. Dudeist rituals should never be taken too seriously. Don’tcha think? Ah, Americans and sarcasm, never did go together very well in my head. Though I’m willing to concede this point I do think anyone just watching the video is not really going to get that. I just have problems with the impending onslaught of misinterpretation caused by comparing us with the christians, rather than say Buddhists, or more correctly Taoists, it’s an eastern thing that most westerners don’t get. I concur with you and your comments. Bless what you want and how you want. I also have been studying Taoist with roots in Catholicism. Quite a contrast in cultures huh? Can we not let this lead to a long drawn out discussion and just be Dudeist? It is what is in our hearts that matter msot. The master corrects him: “No. That is a finger pointing at the moon.”). The prayer is an absurdity meant to underline the fact that prayer itself is an absurdity. Rev. Gary M. Silvia on July 8th, 2011 4:40 pm, “Damn, I kinda forgot we had a prayer”. We don’t have a prayer, we don’t have prayers, we don’t have structures, we don’t even have canon (yes the Big Lebowski can be seen as a type of canon, but it’s not gospel), but we are not involved in saying this is how you should do Dudeism, just do Dudeism. I know I wonder over here from the forum, do some shouting then wonder back again (a bit like an old cat lady), but I rarely feel something is so important. It is nioce to see someone so passionate about a topic. This passion is what is missing in our world today. This has been a very interesting diatribe to say the least. Remember, “The Dude Abides”… and so shall I. As to prayers, I’m also of the opinion that if something is meaningless like a pardoy of a prayer, why do it? If this theatre company wanted us to come along and say “well done, you do us proud” or express a genguine sentiment maybe someone could have turned up, dressed however, with their drink of choice, and simply said “Nice one” or “Great production, really enjoyed it”. Quoting the movie, standardising parodies and performing rituals is surely not in keeping with our easy-going, freethinking, indervidualistic, egalitarian ethos? ps, sorry for being late to the party, having a catch-up day on the last couple of months of DP articles!